For example, Achtemeier's review, of which the predendedly factual statements are often grossly inaccurate. Though worthless as criticism, it cannot confidently be described as "useless." It probably pleased Fitzmyer, who was then editor of The Journal of Biblical Literature, and thus may have helped Achtemeier get the secretaryship of the Society of Biblical Literature. That both names rhyme with "liar" is a curious coincidence. Some important Catholic scholars, including Achtemeier, Fitzmyer, Quesnell, Skehan and Brown, have tended to ignore Secret Mark or dismiss it as worthless. C.S. Mann's Anchor Bible commentary on Mark, published in 1986, represents the whole controversy as finished, a matter of "mere curiosity." With the blessing of the Imprimatur behind him, John P. Meier advised in 1991 that Secret Mark, the Gospels of Thomas and Peter, the Egerton Gospel and all other non-canonical Jesus material were worthless and might simply be thrown "back into the sea." At the same time, there has been an increase in the number of scholars producing Secret Mark studies since 1982. That "Morton Smith seems quite alone in his view that the fragment is a piece of genuine Gospel material," as claimed in 1983 by Beskow is manifestly false. Smith's work in the early 70s was greeted with more-or-less positive reviews by a small number of important scholars including Helmut Koester, Cyril Richardson, George MacRae, and Hugh Trevor-Roper. Some scholars did not write reviews but openly expressed the notion that Smith's work was meritorious. When asked by the New York Times about Smith's interpretation of Jesus as a magician, Krister Stendhal tactfully replied, "I have much sympathy for that way of placing Jesus in the social setting of his time." While that sympathy does not remain particularly widespread, accepting Smith's magical Jesus has nothing to do with taking Secret Mark seriously. The two issues may be discussed separately: the argument for magical practices in early Christianity may certainly be made without reference to Secret Mark, and Secret Mark may be discussed as a text with no more magical implications than we find in canonical Mark. Given the late date of the manuscript itself and the fact that Prof. Smith published photographs of it, it seemed rather beside the point that some scholars wished to dispute the very existence of a manuscript which no one but the editor had seen. My own attempts to see the manuscript in January of 19080 were frustrated, but as witnesses to its existence I can cite the Archimandrite Meliton of the Jerusalem Greek Patriarchate who, after the publication of Smith's work, found the volume at Mar Saba and removed it to the patriarchal library, and the patriarchal librarian, Father Kallistos, who told me that the manuscript (two folios) has been removed from the printed volume and is being repaired. Although one wishes this document were available for the examination of Western scholars, it is no longer reasonable to doubt the existence of the manuscript itself. That it represents an authentic tradition from Clement of Alexandria is disputed only by a handful of scholars and, as Talley also points out, the letter has itself been included in the standard edition of the Alexandrian father's writings since 1980. Taking on the pressing question of Secret Mark's textual relationship with the version of Mark in our New Testament, Helmut Koester has published two intriguing studies arguing that the development of Mark was an evolutionary process. First came the version of Mark known by Matthew and Luke, the proto-Mark or Urmarkus long known to scholars of the synoptic problem. After this original version of Mark was published, the expanded version used by the Alexandrian church in Christian mysteries was made (and from that, its gnosticized Carpocration version). Soon afterward or simultaneously, a mostly expurgated version of Secret Mark was published widely and became canonical Mark. The original Urmarkus, lacking anything not found in Matthew or Luke, went the way of the sayings source and was not preserved. Koester's view has made some inroads. Hans-Martin Schenke adopts it with the modification that Carpocratian Mark predates the Secret Mark of the Alexandrian Church. John Dominic Crossan developed a theory like Koester's in his 1985 Four Other Gospels. Secret Mark has been included in the texts being translated as part of the Scholars Version project, and is described as an early gospel fragment in material that the Jesus Seminar has been making available to popular audiences. None of these treatments is significantly affected by one's assessment of the magical Jesus suggested by Smith. Still, Jesus as magician is not a dead issue. John Dominic Crossan's very intriguing book on The Historical Jesus has an extended discussion of the topic. He argues that Jesus may indeed be understood as a magician. He rejects an artificial dichotomy between magic and religion, saying, "The prescriptive distinction that states that we practice religion but they practice magic should be seen for what it is, a political validation of the approved and the official against the unapproved and unofficial." Conclusion: Where No Secret Gospel Has Gone Before Secret Mark's plight constitutes a warning to all scholars as to the dangers of allowing sentiments of faith to cloud or prevent critical examination of evidence. When seen in light of the massive literature which has been produced by the other major manuscript finds of our century, the Dead Sea Scrolls, Nag Hammadi codices, the comparative dearth of good studies on this piece in particular cannot be explained in any other way that a stubborn refusal to deal with information which might challenge deeply-held personal convictions. It is good to keep in mind an unofficial directive of the Jesus Seminar: "Beware of finding a Jesus entirely congenial to you." "It is my opinion," writes Hans Dieter Betz, "that Smith's book and the texts he discovered should be carefully and seriously studied. Criticizing Smith is not enough." Certainly it is reasonable to concur. After twenty years of confusion, it must be time to set aside emotionalism and approach both this fragment and Morton Smith's assessment of the role of magic in early Christianity with objective and critical eyes. However that question is ultimately to be resolved, Secret Mark provides yet another fascinating window into the remarkable ritual diversity we may identify in the first phases of the development of Christianity. 1 Parker, "An Early Christian Cover-up? ", 5. 2 Smith, "Monasteries and their Manuscripts." 3 Smith, The Secret Gospel, 12. 4 Smith, Clement of Alexandria and a Secret Gospel according to Mark, 1. 5 Smith, The Secret Gospel, 13-14. 8 Knox, "A New Gospel Ascribed to Mark." 9 Smith, "Monasteries and their Manuscripts." 10 Smith, "Hellenika Cheirographa en tei Monei tou Hagiou Sabba." 11 Smith, The Secret Gospel, 76. 12 Smith, Jesus the Magician, 3-4. 13 Smith, The Secret Gospel, 94. 16 Shenker, "A Scholar Infers Jesus Practiced Magic." 17 Skehan, review of Smith's work in Catholic Historical Review, 452. 18 Fitzmyer, "How to Exploit a Secret Gospel," 572. 19 Fitzmyer, "Mark's 'Secret Gospel? '", 65. 20 Achtemeier, review of Smith in Journal of Biblical Literature, 626. 22 Beardslee, review of Smith in Interpretation, 234. 23 Parker, "An Early Christian Cover-Up? ", 5. 26 Brown, "The Relation of 'The Secret Gospel of Mark' to the Fourth Gospel," 466n1. 27 Danker, review of Smith in Dialog, 316. 29 Musurillo, "Morton Smith's Secret Gospel," 328. 30 Brown, "The Relation of 'The Secret Gospel of Mark' to the Fourth Gospel," 466n1. 32 Examples are Achtemeier, review of Smith in the Journal of Biblical Literature 93(1974); MacRae, "Yet Another Jesus"; Gibbs, review of Smith in Theology Today 30(1974); and Fuller, Longer Mark: Forgery, Interpolation, or Old Tradition? 33 See the statements to this effect in Quesnell, "The Mar Saba Clementine," and Hobbs (response in Fuller, Longer Mark: Forgery, Interpolation, or Old Tradition?). 34 Such scholars included Pierson Parker, Edward Hobbs and Per Beskow. 35 See Bruce, The 'Secret' Gospel of Mark; Musurillo, "Morton Smith's Secret Gospel"; and Kummel, "Ein Jahrzehnt Jesusforschung." 36 Fitzmyer, "How to Exploit a Secret Gospel"; Gibbs, review of Smith in Theology Today 30(1974). 37 Danker, review of Smith in Dialog, 316. 40 Quesnell, "The Mar Saba Clementine," 49. 45 Smith, The Secret Gospel, 25. 46 Smith, Clement of Alexandria, ix. 47 Quesnell, "The Mar Saba Clementine," 58. 51 Smith, "On the Authenticity of the Mar Saba Letter of Clement," 196. 52 Quesnell, "A Reply to Morton Smith," 201. 53 Beskow, Strange Tales about Jesus, 101. 54 Smith, "On the Authenticity of the Mar Saba Letter of Clement," 196. 55 Sider, "Unfounded 'Secret'," 160. 56 Private correspondence with Saniel Bonder. 57 Bonder, The Divine Emergence of the World-Teacher, 234. 59 Feuerstein, Holy Madness, 90-92. 61 Bonder, The Divine Emergence of the World-Teacher, 287. 63 It is necessary to stipulate that nothing in the above discussion of the Free Daist Communion should be read as derogatory. The purpose is simple description. Despite the controversy which has sometimes surrounded this movement, the author does not feel that its practices are in any way fraudulent or abusive. Scholars should consider the possibility that examination of modern new religious movements such as the Da Avabhasa sect might be extraordinarily helpful in our understanding of the community dynamics of early libertine Christians such as the Carpocratians. 64 Baigent et al, Holy Blood, Holy Grail, 290. 66 Smith, The Secret Gospel (1982 Dawn Horse edition), 150n7. 67 Mann, Mark (The Anchor Bible), 423. 68 Meier, A Marginal Jew, 140. 69 Beskow, Strange Tales about Jesus, 99. One wonders what a "genuine piece of gospel material" might be. Are gospel additions such as the second ending of Mark (16.9-20) and the famous story of the adulterous woman (John 8.53-9.11) "genuine gospel material," even if we know they were not originally part of the gospels in which they are found? 70 Shenker, "Jesus: New Ideas about his Powers." 71 Talley, "Liturgical Time in the Ancient Church," 45. 73 See Koester, "History and Development of Mark's Gospel," and Ancient Christian Gospels. 74 Schenke, "The Mystery of the Gospel of Mark," 76. 75 Crossan, The Historical Jesus, 310. 76 Funk et al., The Five Gospels, 5. 77 Fuller, Longer Mark: Forgery, Interpolation, or Old Tradition?, 18. Achtemeier, Paul J. Review of Smith. Journal of Biblical Literature 93 (1974): 625-628. Allegro, John M. The Sacred Mushroom and the Cross. New York: Doubleday, 1970. Baigent, Michael, Richard Leigh and Henry Lincoln. Holy Blood, Holy Grail. New York: Delacorte, 1982. Baigent, Michael, Richard Leigh. The Dead Sea Scrolls Deception. New York: Simon & Shuster, 1991. Bauckham, Richard. "Salome the Sister of Jesus, Salome the Disciple of Jesus, and the Secret Gospel of Mark." Novum Testamentum 33 (1991): 245-275. Beardslee, William A. Review of Smith. Interpretation 28 (1974): 234-36. Beskow, Per. Strange Tales about Jesus. Philadelphia: Fortress, 1983. Bonder, Saniel. The Divine Emergence of the World-Teacher. Clearlake, CA: Dawn Horse Press, 1990. Brown, Raymond E. "The Relation of 'The Secret Gospel of Mark' to the Fourth Gospel." Catholic Biblical Quarterly 36 (1974): 466-85. Bruce, F.F. The 'Secret' Gospel of Mark. London: Althone Press, 1974. Bultmann, Rudolf. 1958. Jesus Christ and Mythology. New York: Scribner's, 1958. Burkert, Walter. 1987. Ancient Mystery Cults. Cambridge, MA: Harvard University Press, 1987. Conzelmann, Hans. "Literaturbericht zu den Synoptischen Evangelien (Fortsetzung)." Theologische Rundschau 43 (1978): 23f. Crossan, John Dominic. Four Other Gospels: Shadows on the Contours of Canon. San Francisco: Harper & Row, 1985. ____________. The Cross that Spoke: The Origins of the Passion Narrative. San Francisco: Harper & Row, 1988. ____________. The Historical Jesus: The Life of a Mediterranean Jewish Peasant. Harper San Francisco, 1991. Danker, Frederick W. Review of Smith. Dialog 13 (1974): 316. Donfried, K. "New-Found Fragments of an Early Gospel." Christian Century 90 (1973): 759-60. Feurestien, Georg. Holy Madness: The Shock Tactics and Radical Teachings of Crazy-Wise Adepts, Holy Fools, and Rascal Gurus. New York: Penguin Arkana, 1990. Fitzmyer, Joseph A. "How to Exploit a Secret Gospel." America 128 (1973): 570-572. ____________. Reply to Morton Smith in "Mark's 'Secret Gospel?'." America 129 (1973): 64-65. Frend, W. "A New Jesus?" New York Review of Books 20 (1973): 34-35. Fuller, R. Longer Mark: Forgery, Interpolation, or Old Tradition? (Center for Hermeneutical Studies, colloquy 18), edited by W. Wuellner. Berkeley, CA: Center for Hermeneutical Studies, 1975. Gibbons, J. Review of Smith. Sign 53 (September 1973): 48. Gibbs, J.G. Review of Smith. Theology Today 30 (1974): 423-26. Grant, Robert. "Morton Smith's Two Books." Anglican Theological Review 56 (1974): 58-65. Greene, D.St.A. Review of Smith. The National Observer 12 (1973): 15. Hanson, R.P.C. Review of Smith. Journal of Theological Studies 25 (1974): 513-21. Hobbs, Edward C. Response to Reginald Fuller. In Longer Mark: Forgery, Interpretation, or Old Tradition?, edited by W. Wuellner, 19-25. Berkeley, CA: Center for Hermeneutical Studies, 1975. Horst, P. van der. "Het 'Geheime Markusevangelie.'" Nederlands Theologisch Tijdschrift 33 (1979): 27-51. Jaeger, Werner. Early Christianity and Greek Paideia. Cambridge, MA: Harvard University Press, 1961. Johnson, M.D. Review of Smith. The Lutheran Quarterly 25 (1973): 426-27. Johnson, S. "The Mystery of St. Mark." History Today 25 (1975): 89-97. Kee, Howard Clark. Review of Smith. Journal of the American Academy of Religion 43 (1975): 326-29. Knox, Sanka. "A New Gospel Ascribed to Mark." The New York Times, 30 December 1960, p. 1, 17. ____________. "Expert Disputes 'Secret Gospel'." The New York Times, 31 December 1960, p. 7. Koester, Helmut. Review of Smith. American Historical Review 80 (1975): 620-622. ____________. "History and Development of Mark's Gospel (From Mark to Secret Mark and 'Canonical' Mark)," in Colloquy on New Testament Studies, ed. Bruce Corley. Macon, GA: Mercer University Press, 1983. ____________. Ancient Christian Gospels. Philadelphia: Trinity Press International, 1990. Kolenkow, Anitra Bingham. Response to Reginald Fuller. In Longer Mark: Forgery, Interpretation, or Old Tradition?, edited by W. Wuellner, 33-34. Berkeley, CA: Center for Hermeneutical Studies, 1975. K�mmel, Werner Georg. "Ein Jahrzehnt Jesusforschung (1965-1975)." Theologische Rundschau 40 (1975): 299-302. Levin, Saul. "The Early History of Christianity, in Light of the 'Secret Gospel' of Mark." Aufstieg und Niedergang der R�mischem Welt 2.25.6 (1988): 4270-4292. MacRae, George. "Yet Another Jesus." Commonweal 99 (1974): 417-420. Mack, Burton L. A Myth of Innocence: Mark and Christian Origins. Philadelphia: Fortess, 1988. Mann, C.S. Mark: A New Translation with Introduction and Commentary. The Anchor Bible Series. New York: Doubleday, 1986. Meier, John P. A Marginal Jew: Rethinking the Historical Jesus. Volume One. New York: Doubleday, 1991. Merkel, Helmut. "Auf den Spuren des Urmarkus? Ein neuer Fund und seine Beurteilung." Zeitschrift fuer Theologie und Kirche 71 (1974): 123-144. Metzger, Bruce M. 1972. "Literary Forgeries and Canonical Pseudepigrapha." Journal of Biblical Literature 91 (1972): 3-24. Meyer, Marvin W., ed. The Ancient Mysteries: A Sourcebook. San Francisco: Harper & Row, 1987. Mullins, Terence Y. "Papias and Clement and Mark's Two Gospels." Vigiliae Christianae 30: 189-92. Musurillo, H. "Morton Smith's Secret Gospel." Thought 48 (1974): 327-331. Osborn, Eric. "Clement of Alexandria: A Review of Research, 1958-1982." The Second Century 3 (1983): 219-244. Pagels, Elaine. Foreword to the 1982 reprint of The Secret Gospel. Clearlake, CA: Dawn Horse Press, 1982. Parker, Pierson. "An Early Christian Cover-Up?" New York Times Book Review, 22 July 1973, p. 5. ____________. "On Professor Morton Smith's Find at Mar Saba." Anglican Theological Review 56 (1974): 53-57. Patterson, Stephen J. and Helmut Kuester. "The Secret Gospel of Mark," 402-405 in Miller, Robert J., ed., The Complete Gospels: Scholars Version. Sonoma, CA: Polebridge Press, 1992. Petersen, N. Review of Smith. Southern Humanities Review 8 (1974): 525-531. Prophet, Elizabeth Clare. The Lost Years of Jesus: Documentary Evidence of Jesus' 17-Year Journey to the East. Livingston, MT: Summit University Press, 1987. Quesnell, Quentin. Review of Smith. National Catholic Reporter, Nov. 30, 1973. ____________. "The Mar Saba Clementine: A Question of Evidence." Catholic Biblical Quarterly 37 (1975): 48-67. ____________. "A Reply to Morton Smith." Catholic Biblical Quarterly 38 (1976): 200-203. Reese, J. Review of Smith. Catholic Biblical Quarterly 36 (1974): 434-435. Richardson, Cyril C. Review of Smith. Theological Studies 35 (1974): 571-77. Schenke, Hans-Martin. "The Mystery of the Gospel of Mark." The Second Century 4 (1984):65-82. ____________. "The Function and Background of the Beloved Disciple in the Gospel of John," in Nag Hammadi, Gnosticism, and Early Christianity, Charles W. Hedrick and Robert Hodgson, Jr., eds. Peabody, MA: Hendrickson, 1986. Schmidt, Daryl D. The Gospel of Mark. Scholars Version. Sonoma, CA: Polebridge Press, 1990. Scroggs, Robin. Review of Smith. Chicago Theological Seminary Register 1974: 58. Scroggs, Robin, and Kent I. Groff. "Baptism in Mark: Dying and Rising with Christ." Journal of Biblical Literature 92 (1973): 531-548. Shenker, Israel. "A Scholar Infers Jesus Practiced Magic." The New York Times, 23 May 1973, p. 39. ____________. "Jesus: New Ideas about His Powers." The New York Times, 3 June 1973, p. IV 12. Sider, Ronald J. "Unfounded 'Secret'." Christianity Today 18 (9 Nov 1973): 160. Skehan, Patrick W. Review of Smith 1973b. Catholic Historical Review 60 (1974): 451-53. Smith, Morton. "Hellenika Cheirographa en tei Monei tou Hagiou Sabba." Nea Sion 52 (1960): 110-125, 245-256. ____________. "Monasteries and their Manuscripts." Archaeology 13 (1960): 172-177. ____________. 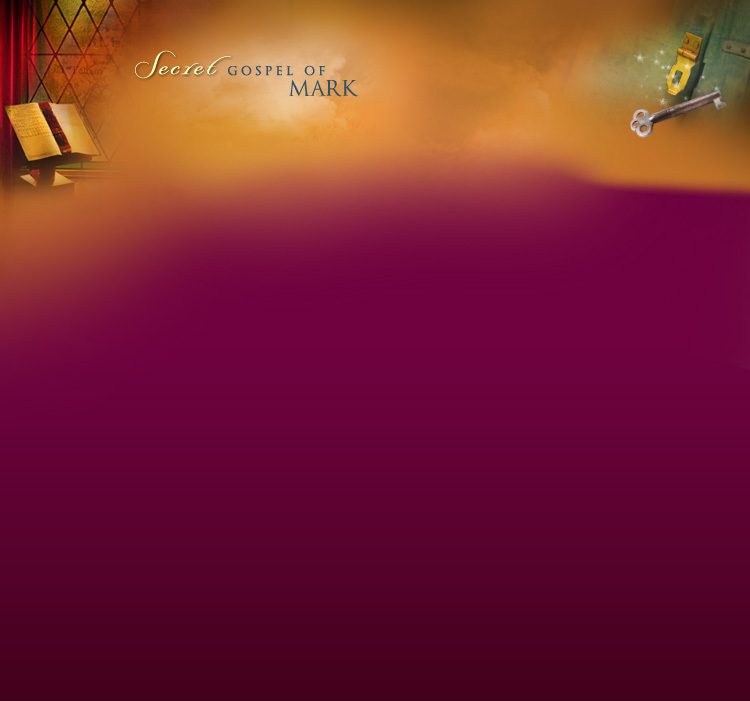 The Secret Gospel: The Discovery and Interpretation of the Secret Gospel according to Mark. New York: Harper & Row, 1973. ____________. Clement of Alexandria and a Secret Gospel of Mark. Cambridge, MA: Harvard University Press, 1973. ____________. Reply to Joseph Fitzmeyer in "Mark's 'Secret Gospel?'." America 129 (1973): 64-65. ____________. "Merkel on the Longer Text of Mark." Zeitschrift fuer Theologie und Kirche 72 (1975): 133-150. ____________. "On the Authenticity of the Mar Saba Letter of Clement." Catholic Biblical Quarterly 38 (1976): 196-199. ____________. "A Rare Sense of prokopt� and the Authenticity of the Letter of Clement of Alexandria," in God's Christ and His People: Studies in Honor of Nils Alstrup Dahl, ed. Jacob Jervell and Wayne A. Meeks. Oslo: Universitetsforlaget, 1977. ____________. Jesus the Magician. New York: Harper & Row, 1978. ____________. "Clement of Alexandria and Secret Mark: The Score at the End of the First Decade." Harvard Theological Review 75 (1982): 449-461. ____________. Postscript to the 1982 reprint of The Secret Gospel. Clearlake, CA: Dawn Horse Press, 1982. ____________. "Paul's Arguments as Evidence of the Christianity from which he Diverged." Harvard Theological Review 79 (1986): 254-60. Stagg, F. Review of Smith. Review and Expositor 71 (1974): 108-110. Talley, Thomas. "Liturgical Time in the Ancient Church: The State of Research." Studia Liturgica 14 (1982): 34-51. Trevor-Roper, Hugh. "Gospel of Liberty." London Sunday Times (30 June 1974), 15. Trocm�, �tienne. "Trois critques au miroir de l'�vangile selon Marc." Revue d'histoire et philosophie religieuses 55 (1974): 289-295. Wilson, Ian. Jesus: The Evidence. San Francisco: Harper & Row, 1984. Wink, Walter. "Jesus as Magician." Union Seminary Quarterly Review 30 (1974): 3-14. Yamauchi, Edwin M. "A Secret Gospel of Jesus as 'Magus?' A Review of Recent Works of Morton Smith." Christian Scholars Review 4 (1975): 238-251. Author's note: The author would like to offer thanks to Saniel Bonder of the Mountain of Attention Sanctuary for his kind assistance in providing research materials and his willingness to share with me information pertaining to The Dawn Horse Press and The Secret Gospel. Further thanks are due to Dr. Jon Daniels of The Defiance College for his helpful insights into the subject matter of this study.